Ginch Gonch is having a wedgie contest. 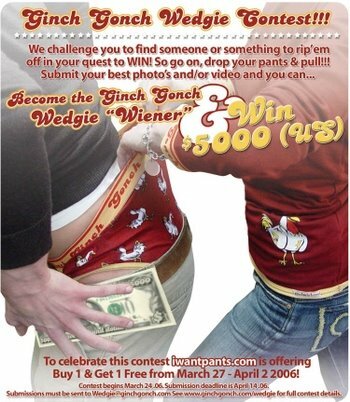 Send them a photo or a video of your best wedgie and you could win 5000 dollars towards some new undies. Sweet deal, huh? So thought I'd let you know all about it. For more info and official rules check out their site. Well everyone is launching their spring lines of undies right about now. Yes that's right. New undies!! So I thought that it would only be fitting to tell you about some of them. I will start off with Aussiebum's new line. They are suggesting that you go commando! Yes that's right commando. But they don't mean go without underwear (that wouldn't benefit their business at all). What they mean by commando is go military, go camo, but be fun at the same time. So they've launched their new line of undies. Pictured is the scuba brief which you can get for ~$24 us. I'm guessing the reason the scuba briefs are blue is so you will blend in with the waves in case swimming commando is your thing. A bit pricey but very cool for spring. For the full commando line go to their online store and click on underwear and then commando. What do you think of military (camouflage) undies? And what do actual military wear (if you know the answer, because I don't)? PS. Today is officially the first anniversary of the first ever underwear blog (that's us!). Can you believe that it has already been a year? Thank you so much for all your continuing support for the past year. Our first anniversary is March 18th. I'd really like to thank you all. Also I realize that many of you are avid readers of the ublog and continually check for updates. I'm really sorry that I don't update more often, but thank you so much for all your patience and enthusiasm. In honor of our anniversery I'd like to hear from you what you think about the blog. And I'd like to get some candid feedback (negative or positive) and some ideas for new features. Speaking of new features I'd like to add a testimonial section, so if you feel so inspired to write one for this blog (no pressure) I'd really welcome that. 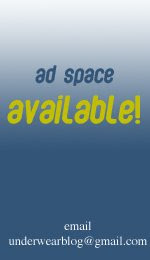 So send all your feedback, testimonials, questions, comments, w/e to my e-mail address (in the sidebar).